Official artwork for Ray Mk III in Custom Robo Arena. The Ray Mk III (レイMkIII, Ray Mk III) is a Robo from the Custom Robo series. The Ray Mk III is a Robo in the 'Ray' series that hails from the Custom Robo series. It is a well balanced 'Power Model' from the Shining Fighter line. It first appears in Custom Robo Arena for the Nintendo DS. In Custom Robo Arena, the main character switched his Ray Mk II, which was the main Robo used by the protagonist in Custom Robo V2, to a new model made by his sister and father. Ray Mk III using its laser in Brawl. In Brawl, this small yet hardy fighter leaps around the arena while firing a volley of lasers from its hand-held blaster and occasionally, an explosive charge with its bomb launcher. It is an unlockable Assist Trophy and becomes available after playing 100 brawls. Ray Mk III set for Mii Gunner. Ray Mk III does not reprise its role as an Assist Trophy. Instead, it appears as a costume for Mii Gunner. Ray Mk III also appears as a Primary Spirit in Ultimate after being enhanced from Ray Mk II Spirit. It is an Ace three star Spirit with three open slots and the Lightweight characteristic. Official artwork of Ray Mk III from Brawl. With its debut on October 2006, Ray Mk III is the newest Assist Trophy in Super Smash Bros. Brawl. Ray Mk III, Jill, Magnus, Prince Sablé, Phosphora, Sukapon and Yuri Kozukata are the only assist trophy characters that have appeared in only one game outside of their Smash appearances. 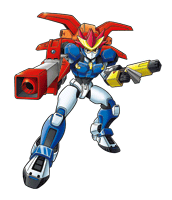 It is very likely, due to trophy description and design of trophy, that this is the exact same model from the Nintendo DS game Custom Robo Arena, as the player is referred to as the "main" character, and has a father and sister, who created the Mk series. This page was last edited on March 10, 2019, at 15:21.